NASCAR announced today the broadcast schedule for the remainder of the 2014 NASCAR K&N Pro Series and NASCAR Whelen Modified Tours Championship events on FOX Sports 1. The schedule includes 28 events for NASCAR’s touring series including previously aired races from Bristol Motor Speedway, Greenville Pickens Speedway, and Irwindale Speedway. The NASCAR K&N Pro Series East and West schedules are highlighted by the two combination events at Iowa Speedway in Newton, and both season finales – Dover International Speedway in September for the K&N East and a November date at Phoenix International Raceway in Avondale, Ariz., for the K&N West, both companion events to the NASCAR Sprint Cup Series. Also of note is the K&N East return to New York’s Watkins Glen International for the first time since 2009. The popular annual Whelen Modified/Southern Modified Tour date in August at Bristol Motor Speedway is on the slate. Additionally, both the July and September Whelen Modified Tour dates at New Hampshire Motor Speedway in Loudon are scheduled to air, as is an October trip to Thompson (Conn.) Speedway Motorsports Park for the tour’s final race of the season. 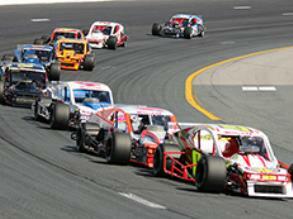 Both NWMT events at "The Magic Mile" will be broadcasted on Fox Sports in 2014.